There was something I’ve wanted to try for a little while. Messaging is something that’s interested me and with all of the work I’ve been doing on the Zend Developer Cloud I’ve been interested in seeing how to make things communicate a little better. One of the ideas I’ve wanted to try was to use instant messaging for notification when slow request or large memory usage events occur. So to test this out I decided to write a handler that would take events and pass them off to a Jabber server. That way when the events occur they’ll be passed to your IM client instead of flooding your email client. It took a little longer than I wanted, mostly due to the fact that the XMPP protocol is new to me, many of the examples don’t work and it required setting up a server that I was not familiar with. I ended up using the XMPPHP library and the Openfire server to do my dirty work. I used PHPCloud as dev environment. So what I’m going to do is open it up to anyone who wants to try it. I make no guarantees as to its usefulness or stability but I figured that it would be cool to try. First of all, you will need an XMPP/Jabber IM client. I used Trillian and it worked fine. This will provide an email address for you that you will copy and past into your instance of Zend Server. 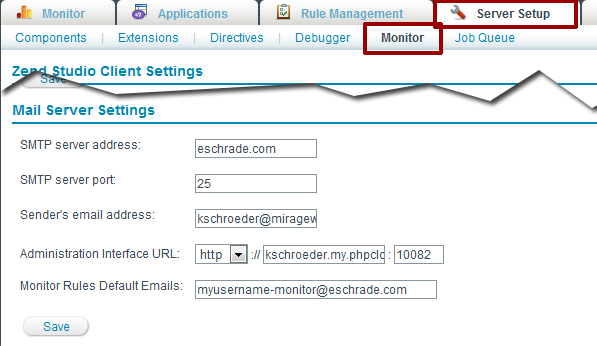 Log in to your instance of Zend Server, or click on the link if you are in the DevCloud and go to Server Setup -> Monitor. For the mail server, enter in eschrade.com (because that’s where the notification messages will go), set whatever you want for the Sender Email Address and change the Monitor Rules Default Emails setting to the email address provided in the form above. Now go to the Monitor settings under Rule Management. 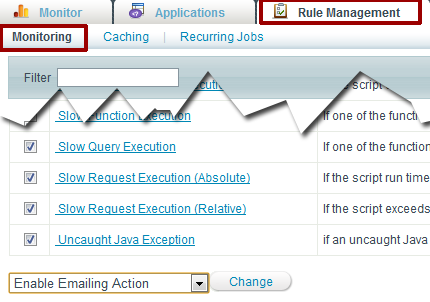 Select all of the rules, or just the ones you want notifications for, select Email Emailing Action and click Change. You may need to restart Zend Server. After that you need to take your XMPP/Jabber client and connect it to my server. Your credentials will be your [email protected], with the password you specified. Now the next time an event occurs on your Zend Server or DevCloud system you should get a message in your IM like this. Note that this is NOT an officially supported Zend service, I am just trying this out and wanted to offer it to others to see if they wanted to try it out too. If you want to see how to set it up, here is a YouTube video of how it works.